Whew! A lot has happened on the tundra in the past two weeks! Since my last post the weather has gone from one extreme to another with multiple snow-storms and now blistering heat. While I’ve been coping with the weather by switching between my parka and sunhat depending upon the day, how do birds fare in the face of all of this variation? 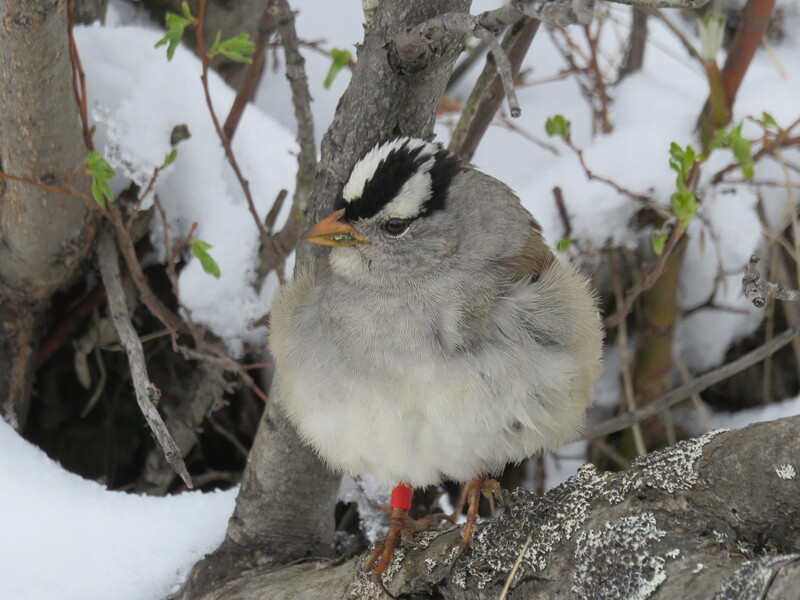 Adult White-crowned sparrow with puffed up feathers to retain body heat in the cold. Unfortunately, when snow-storms swept across the tundra, many of the “early birds” who nested at the end of May lost their nest. When the weather becomes too harsh, sometimes incubating and brooding females will abandon their nests leading to frozen eggs and starving nestlings. However, our sparrows show remarkable resilience after this challenge. So far we’ve discovered that at least 8 of our birds that lost their nests in the snow have “renested” or built second nests and laid another round of eggs. This is a pretty remarkable achievement when you consider that one egg can represent 8 percent of a White-crowned sparrow’s body mass, and most females will produce a total of 4-5 eggs over the course of lay. That’s kind of like a 150 person producing a 12 pound baby every day, four to five days in a row! 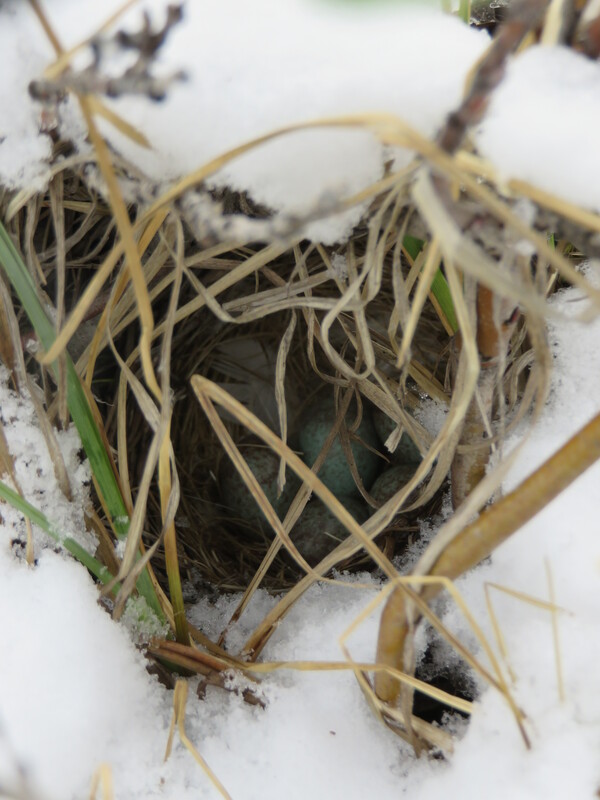 White-crowned sparrow nest in the snow. However, for scientists studying ground nesting birds, lots of renests means lots more work. Unlike Alli’s Tree Swallows which nest in boxes, White-crowned sparrows nest in the ground, typically at the base of dwarf shrubs. To find nests, scientists have to do one of two things 1.) traverse across the tundra and hope you “flush” (aka startle) a female bird from her nest when you walk by or 2.) find a female bird and follow her with your binoculars until she goes back to her nest. On days when we’re looking for birds, we walk over 6 miles and may spend 4-5 hours trying to find a single nest. Fortunately, finding nests gets easier with practice and it’s certainly taught me patience, which is good because with all of the renests after this spring’s storms I’ve spent a lot of extra time nest searching! Even though these developments have made for long days in the field, I’m really excited to see how this tumultuous spring affects the reproductive success of my birds and the time they spend preparing for Fall migration. Stay tuned for further updates! Next Post Field Notes: Ryane’s first field season at Chicken Camp!